Rarely can it be said that a film has defined a genre, but never is that more true than in the case of The Godfather. Since the release of the 1972 epic (which garnered ten Academy Award nominations and was named Best Picture), all "gangster movies" have been judged by the standards of this one (unfair as the comparison may be). If a film is about Jewish mobsters, it's a "Jewish Godfather"; if it's about the Chinese underworld, it's an "Oriental Godfather"; if it takes place in contemporary times, it's a "modern day Godfather." If The Godfather was only about gun-toting Mafia types, it would never have garnered as many accolades. The characteristic that sets this film apart from so many of its predecessors and successors is its ability to weave the often-disparate layers of story into a cohesive whole. Any of the individual issues explored by The Godfather are strong enough to form the foundation of a movie. Here, however, bolstered by so many complimentary themes, each is given added resonance. The picture is a series of mini-climaxes, all building to the devastating, definitive conclusion. Rarely does a film tell as many diverse-yet-interconnected stories. Strong performances, solid directing, and a tightly-plotted script all contribute to The Godfather's success. This motion picture was not slapped together to satiate the appetite of the masses; it was carefully and painstakingly crafted. Every major character - and more than a few minor ones - is molded into a distinct, complex individual. Stereotypes did not influence Coppola's film, although certain ones were formed as a result of it. 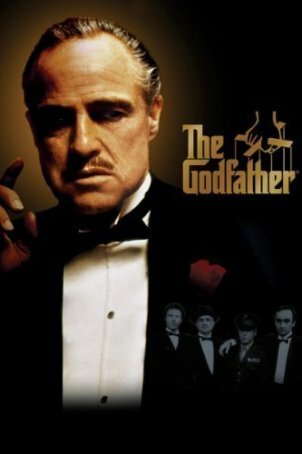 The film opens in the study of Don Vito Corleone (Marlon Brando), the Godfather, who is holding court. It is the wedding of his daughter Connie (Talia Shire), and no Sicilian can refuse a request on that day. So the supplicants come, each wanting something different - revenge, a husband for their daughter, a part in a movie. The family has gathered for the event. Michael (Al Pacino), Don Vito's youngest son and a second world war hero, is back home in the company of a new girlfriend (Diane Keaton). The two older boys, Sonny (James Caan) and Fredo (John Cazale), are there as well, along with their "adopted" brother, Tom Hagen (Robert Duvall), the don's right-hand man. With the end of the war, the times are changing, and as much as Don Vito seems in control at the wedding, his power is beginning to erode. By the standards of some, his views on the importance of family, loyalty, and respect are antiquated. Even his heir apparent, Sonny, disagrees with his refusal to get into the drug business. Gambling and alcohol are forces of the past and present; narcotics are the future. But Don Vito will not compromise, even when a powerful drug supplier named Sollozzo (Al Lettieri) arrives with promises of high profits for those who back him. Don Vito's refusal to do business with Sollozzo strikes the first sparks of a war that will last for years and cost many lives. Each of the five major mob families in New York will be gouged by the bloodshed, and a new order will emerge. Betrayals will take place, and the Corleone family will be shaken to its roots by treachery from both within and without. The Corleone with the most screen time is Michael (it's therefore odd that Al Pacino received a Best Supporting Actor nomination), and his tale, because of its scope and breadth, is marginally dominant. His transformation from "innocent" bystander to central manipulator is the stuff of a Shakespearean tragedy. By the end, this man who claimed to be different from the rest of his family has become more ruthless than Don Vito ever was. Despite the likes of Serpico, Dog Day Afternoon, Scarface, ...And Justice for All, and Scent of a Woman on his resume, Pacino is best remembered for the role he created in The Godfather (and subsequently reprised in two sequels). While this is not his most demonstrative performance - indeed, he is exceptionally restrained - the quality of the script makes Michael Corleone notable. Next to Humphrey Bogart's Rick from Casablanca, Oscar winner Marlon Brando's Don Vito may be the most imitated character in screen history. The line "I'm gonna make him an offer he can't refuse" has attained legendary status, as has the entire performance. With his raspy voice, deliberate movements, and penetrating stare, Brando has created a personae that will be recalled for as long as motion pictures exist. Don Vito is a most complicated gangster. In his own words, he is not a killer, and he never mixes business with personal matters. He puts family first ("A man who doesn't spend time with his family can never be a real man") and despises displays of weakness. He understands the burden of power, and his wordless sympathy for Michael when he is forced to assume the "throne", is one of The Godfather's most revealing moments (about both father and son). The Godfather had three Best Supporting Actor nominees, all well-deserved. The first was Pacino (who probably should have been nominated alongside Brando in the Best Actor category). The other two were James Caan and Robert Duvall. In a way, it's surprising that Duvall wasn't passed over. His presence in The Godfather isn't flashy or attention-arresting. Like his character of Tom Hagen, he is steady, reliable, and stays in the background. Not so for Caan's Sonny, whose demonstrative and volatile personality can't be overlooked. Family responsibility. A father's legacy. The need to earn respect. The corrupting influence of power. These are some of the ingredients combined in Francis Ford Coppola's cinematic blender. They are themes which have intrigued the greatest authors of every medium through the centuries. Although the issues presented in The Godfather are universal in scope, the characters and setting are decidedly ethnic. Even to this day, there is an odd romanticism associated with New York's Italian crime families. The word "Mafia" conjures up images of the sinister and mysterious - scenes of the sort where Luca Brasi meets his fate. Francis Ford Coppola has tapped into this fascination and woven it as yet another element of the many that make his motion picture a compelling experience. We come to The Godfather like Kay Adams - outsiders uncertain in our expectations - but it doesn't take long for us to be captivated by this intricate, violent world. The film can be viewed on many levels, with equal satisfaction awaiting those who just want a good story, and those who demand much more. The Godfather is long, yes - but it is one-hundred seventy minutes well-spent. When the closing credits roll, only a portion of the story has been told. Yet that last haunting image (Kay's shock of recognition), coupled with Nino Rota's mournful score, leaves a crater-like impression that The Godfather Part II only deepens.